All options have so-called time value, which is a part of their value that changes with the passage of time. Theta is the risk measure which tells how the option value changes with time. 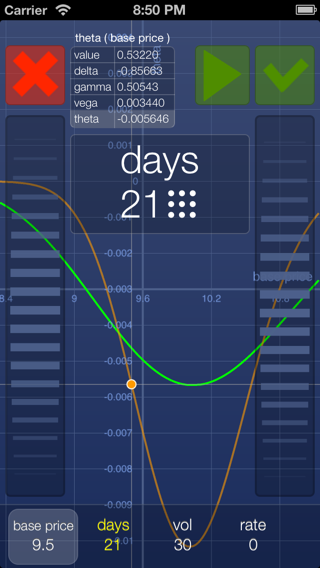 The most common form of theta is day theta, used in this app. The day theta tells exactly how much more the option will cost tomorrow, if all other parameters, like the base price or volatility stay the same. Since in most cases a long position in an option loses value with time (so called theta decay), the theta of a long option position is usually negative. Theta graph looks very similar to inverted gamma graph, whenever the gamma is positive the theta is negative and vice versa. This study graph shows how theta of a put option changes with the base price, the lowest point on the graph coinsides with the strike price. This means that at-the-money options are the most susceptible to theta decay. See also greeks, gamma, time value.